Amsterdam Noord (North Amsterdam) is a bit isolated on the other side of the center above the river IJ. There is a free ferry from Central Station, runs every 5 minutes to the other side. The ferry is an attraction on itself and a nice way to see (a part of) Amsterdam from the water. Lots of residents use this boat to go to the other side and travel further by bike. The best thing to do is to rent a bike if you are planning to visit this “off the tourist track” area. Amsterdam Noord is an inspiring and vibrant part of Amsterdam with unique architecture. Until the 1980’s a large part of Amsterdam Noord was used as a shipyard. Currently you will find many creative agencies and cultural entrepreneurs on these premises. The NDSM Wharf (‘NDSM werf’) is used as a musical festival area. The EYE Film Institute Netherlands is located in a new designed building on the banks of the River IJ. The largest and most attractive flea market in Europe is organized once a month in the IJ-hallen (IJ-halls). With up to 750 stands you will definitely find something of your choice. If you are looking for little treasures, it is best to arrive early. Prices are mostly very low. 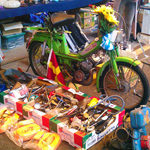 Entry to the fleamarket is EUR 4,50 per adult, kids EUR 2 (11 years and under). You can check the website for the exact dates. For food lovers, Amsterdam Noord has a lot to offer. ‘Hotel de Goudfazant’ is not a hotel, but a restaurant with a French cuisine and fantastic waterside views. A seasonal 3-course menu is very affordable. At the water’s edge the IJ-Kantine is situated (former canteen of the NDSM shipyard) and has become one of the hotspots in Amsterdam North. This is a great restaurant for families. Another restaurant for families is ‘Noorderlicht’ located in a transparent dome with a fantastic terrace. 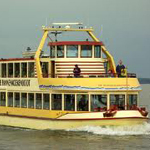 Or enjoy all-you-can-eat pancakes while cruising on the ‘Pannenkoekenboot’ (Pancake Boat). Great for kids with a large playroom filled with 20.000 colored balls in the hold of the boat. You can let your children amuse themselves while eating another pancake and enjoying the view. Various culinary tours are available.